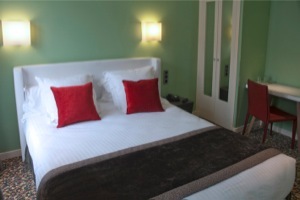 The Grand Hotel Mahler is located in the heart of Paris, in the picturesque Marais district. The hotel is located a few steps from the Place des Vosges, Bastille Opera, the Picasso and Carnavalet museums and the Centre Beaubourg. The Grand hotel Mahler is near île Saint-Louis and Notre-Dame. The rooms are decorated with soft colours, very comfortable and well-equipped : bathroom with shower, TV with flat screen, minibar. Also book your place in the nearest parking of the hotel and take advantage of the preferential rates exclusively through our website!